BeerAttraction is the international event dedicated to specialty and craft beers, technologies and ingredients. The event, organized by RIMINI FIERA, is dedicated to specialty and craft beers, technologies and ingredients. 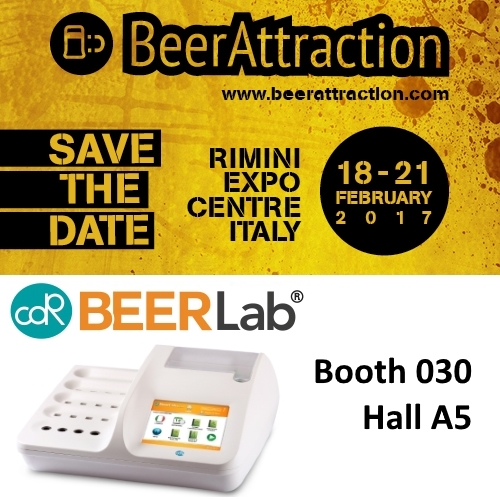 CDR BeerLab®, the system analysis of the beer to control the brewing process, is at Booth 030 Hall A5 where it will be presented by CDR and Sacco, distributor for Italy and analytics provider for breweries. CDR BeerLab® for the analysis of beer is waiting for you in BeerAttraction 2017 was last modified: May 3rd, 2017 by CDR s.r.l.